In the warmer weather, our skin is bound to get shiny, but there are ways to control it! A little shine is healthy looking, but looking like you just got out of a pool is not cute! 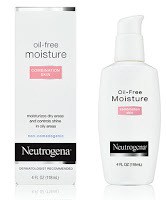 I have found that using a moisturizer by Neutrogena for combination skin is a great first step in controlling oil throughout he day. This moisturizer is engineered to moisturize dry areas and control oil in your T-zone, which is perfect. I have used it a few times and it seems to be working well. The downside of this moisturizer is that it doesn't have SPF protection. So, if I know I am going to be in the sun a lot that day I will opt for a moisturizer with SPF (Cetaphil SPF 15) or use a foundation or BB cream that contains SPF. 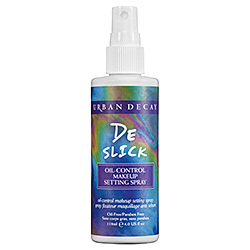 The other product I have found that is a MUST for controlling shine throughout the day is the Urban Decay De-Slick makeup setting spray. Simply mist the spray over your face after your finished with all your makeup, and it sets your makeup and keeps oiliness to a minimum all day! I have also heard that spraying this BEFORE and after makeup application works wonders, I haven't tried this yet but I can understand why it would be a smart idea. This product is pricey at $29, but its a large bottle and it will last forever. Plus, it is super effective! There are great tips for sweat proof eye makeup as well that I will make into another post and hopefully a video tutorial :-). Hope this helps guys! Great post! I completely agree that Deslick setting spray is a must. I have the Deslick setting powder, and I feel like that combined with the setting spray would keep my face looking matte all day! Lovely blog!